I feel the hardest part of any pallet project is disassembling the pallet, right? I use a sawsal to cut through the nails. Cut boards to length using a miter saw. Thoroughly sand the boards first with 80 grit followed by 120 grit sanding pads. The pallet boards will be rough so ensure you spend a good amount of time sanding to ensuring boards are smooth to the touch to prevent splinters. Assemble rack by nailing top 1x4 to top end of 2x4s, bottom 1x4 to bottom of 2x4s, adding 1x4 to front approximately 7" from the bottom. Turn over and nail 3 remaining 1x4s on back placing the first on top and remaining 2 across the bottom. 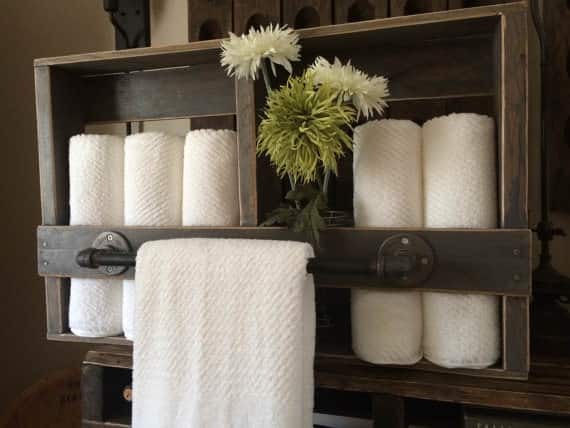 Stain rack using stain of choice.  At Knotty Pallet, we use Minwax stain and spray it on with a HLVP spray gun. Wipe excess stain and allow to dry overnight. Sand stain off edges with 80 grit sanding pads. Once poly is dry, lightly sand with 220 grit paper. Wipe off sanding dust and repeat steps 7 and 8 twice. (apply second and third coats of poly). Assemble industrial pipes, and ensure you wipe the oil off the piping. Attach to towel rack with screws and you are finished! See this and many more of our pallet projects at our website Knotty Pallet. 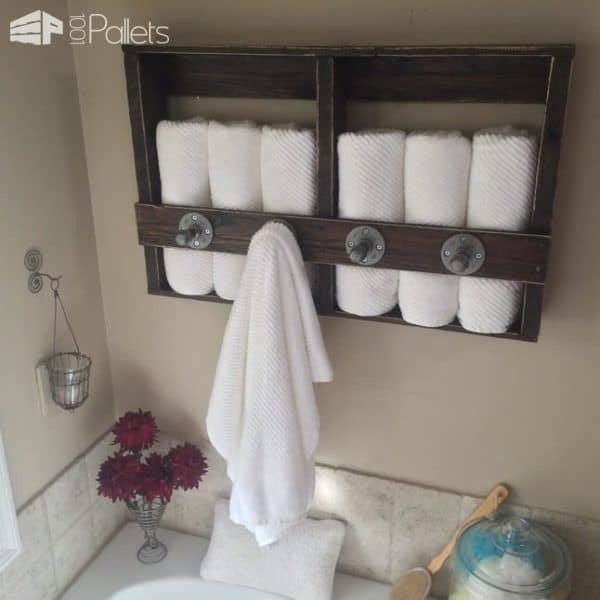 A lovely way to display a bath towel or hang several for every day after shower routines. Store your favorite bathroom luxuries in the built-in shelf. Shown in classic gray, dark walnut brown & ebony. 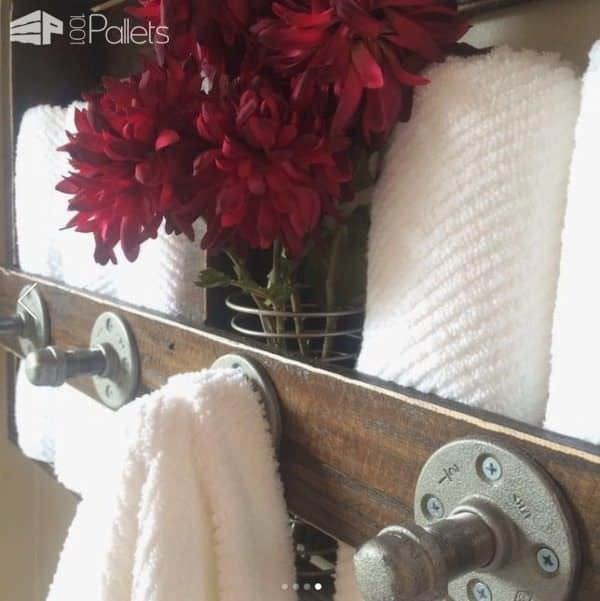 Choose from a single towel bar or 3-4 industrial style hooks with either silver or oil rubbed bronze pipe. 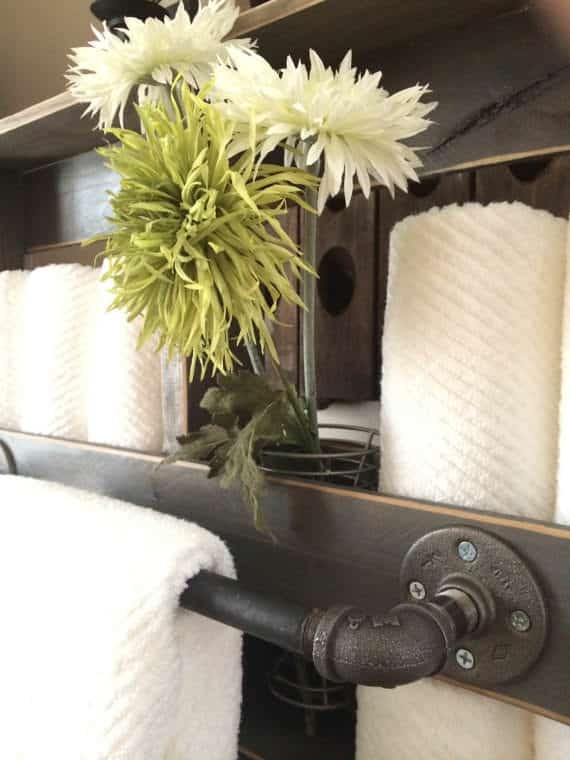 Combine it with the matching Danno Paper Holder & Corey Paper Towel Bar; you'll have a complete look! I made this with the industrial piping but after one day of using it, one of our white towels got what I assume is rust on it. I wiped down the pipe before hand. Have you had this happen before? Anyone have any ideas on how to prevent this? This is great! I am sharing this on Pinterest.